1. Establish a sleep routine. Sleep is very important for the healthy development of children. 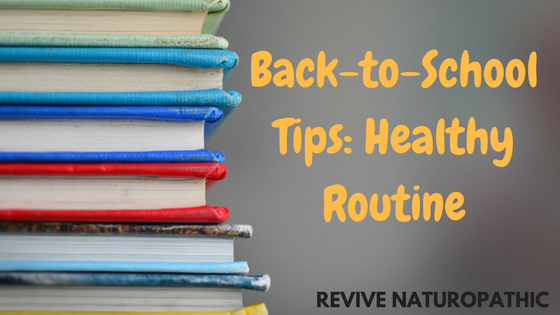 Start a wake-up and sleep time routine a couple weeks before school starts. Most experts agree that children need 9 to 10 hours of sleep. Remember, a good day starts with a good night’s sleep. 2. Start the day right with a healthy breakfast. A healthy breakfast is critical for giving the body the energy and nutrients needed for growth and development. In addition, eating breakfast improves focus and concentration, allowing your child to perform well in school. Aim to have more protein and fibre and reduce processed sugar. 3. Pack nutritious lunches and snacks. Be sure to include whole grains, fresh vegetables and fruit, legumes, and seeds. Instead of using refined sugar or cane sugar, use pure maple syrup, coconut sugar, or honey. Keep a variety of nutritious food available in the home, and let your child choose what and how much they want to eat. This will help instill the ability to make healthy food choices. 4.Find an after-school routine that works for your family. Ensure that there is time for homework, breaks, chores, and extracurricular activities, but also make sure that there is a balance. Sitting together as a family at dinnertime will allow for you and your children to talk about the day. Don’t wait too long to put a healthy routine for your children into place. We recommend starting now because routines will help your family know what to expect and prepare for each day. If you have any questions or to learn more about how to keep your children healthy, contact the friendly and knowledgeable doctors at Revive Naturopathic today at 604-576-5889 or doctors@revivenaturopathic.com!